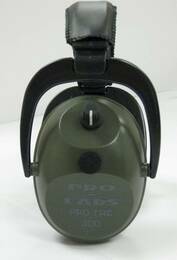 Pro Tac 300 Police and Military Electronic Ear Muffs from Altus Brands provide many of the same features as in the top of the line Pro Mag model, but in a less expensive, smaller and lighter weight, low-profile design that is an excellent choice for many police and military operations. Available in Black or Military Green. NRR 26 - Excellent noise protection rating suitable for use with all but the largest caliber firearms. Dynamic Level Sound Compression Technology - Lets you hear everything, but compressed into a single safe volume level. 5.5 millisecond attack time - Very fast reaction time means you are protected instantly from loud sounds. 9.1 ounce weight - Very light weight for extended wear in comfort. Separate microphone and speaker setup in each ear cup - Lets you compensate for mild hearing loss in one ear, and gives you stereo sound for superb left/right directionality of sound. Preset 15 dB gain - This helps you hear quiet sounds around you, while louder sounds are reduced in volume. Solid state analog circuitry - Reliable and impact resistant. Pro Form Leather Ear Muff pads and padded headband - Means "no sweat" comfort even in extended wear. Optional neckband and hard hat mounts available - Maximize the places you can use your Pro Tac 300 Headset: At the range, in the field, at work, around the shop. Pro Tac Police and Military Electronic Ear Muffs are ideal for all Police and Military ops, from practice on the range to tactical operations in the field.